This might sound unbelievable but it’s true.. A Nigerian woman has been childless for 21 years.. and then when she finally got pregnant.. She carried the pregnancy for 3 years and 2 months before finally giving birth. 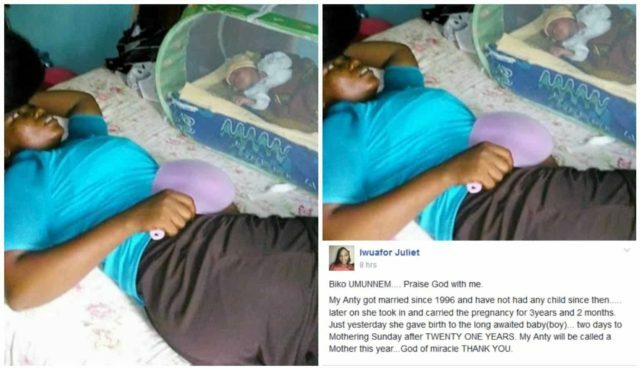 Facebook user, Iwuafor Juliet shared the testimony and claims the lady involved is her aunt. According to her, her aunty got married in 1996 and never had a child till she eventually ‘got pregnant’ in 2014. "My Aunty got married since 1996 and have not had any child since then….. later on she took in and carried the pregnancy for 3years and 2 months. Just yesterday she gave birth to the long awaited baby(boy)… two days to Mothering Sunday after TWENTY ONE YEARS. My Aunty will be called a Mother this year…God of miracle THANK YOU."